Bryanskaya Oblast is situated in the central part of the East European plain. Distance between the western and eastern points is 270 km, between the northern and southern ones is 190 km. In the south it borders upon Ukraine, in the west and northwest - upon Byelorussia, to the north lies Smolenskaya Oblast, in northeast - Kaluzhskaya Oblast, in the east - Orlovskaya Oblast and in the southeast Kurskaya Oblast is situated. The main rivers here are the Desna (with its tributary Navlya) and Iput. The climate is moderate continental. Winter is rather mild and snowy, summer is warm. Average temperature of January is 7-9 degrees centigrade below zero, of July 18 - 19 degrees above zero. Average annual precipitations make 560-600 mm. The National Reserve "The Bryansk forest" occupies the area of 12 thousand hectares. It was established on July 5, 1944. The area of Bryanskaya Oblast is 34,9 thousand sq. km (0,2 % of the total area of the Russian Federation). Bryansk is the centre of the region. Distance between Bryansk and Moscow is 379 km. Bryansk was founded in the year of 985. 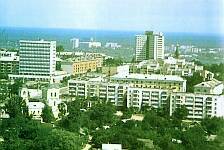 The city consists of 4 administrative districts: Bezhitsky, Volodarsky, Sovetsky and Fokinsky. The history of the Bryansk region goes back to the X century, when the Kiev prince Vladimir in order to override the Vyatichi tribes began to found fortresses near the river Desna. In 985 the city - fortress Bryansk was laid. It played an important role as a centre of dissemination of Christianity in the vicinity. Bryanskaya Oblast can be called theatrical. The city of Bryansk is famous for it's regional Drama Theatre named after A.K. Tolstoy and some other theatres. 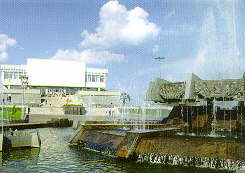 The concert hall "Friendship" constructed specially to commemorate the 1000th anniversary of Bryansk adorned the Desna quay. The Bryansk Philharmonic society and the Bryansk Musical School enjoy wide popularity among its amateurs. A number of musical educational establishments and establishments of culture in Bryanskaya Oblast provides great opportunity to develop young great talents. So the Bryansk City Academic Chorus in two years became the winner of prestigious international contests in Moscow, Spain, Hungary and Italy. 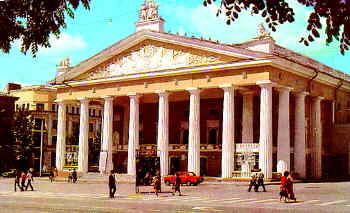 The twentieth century for Bryansk theatrical life was the time for development of the national music, songs and dance.